Did you know that pre-ground coffee beans are stale before you even get them home? Well whole beans have a use-by-date too. Once roasted, coffee beans begin to change chemically. During the first four or five days, the roasted beans are actively releasing a lot of carbon dioxide which makes them unsuitable for brewing until they're approximately one week old. They then start to go stale no matter how they're stored and, soon after, loose their rich, sweet and creamy oils. 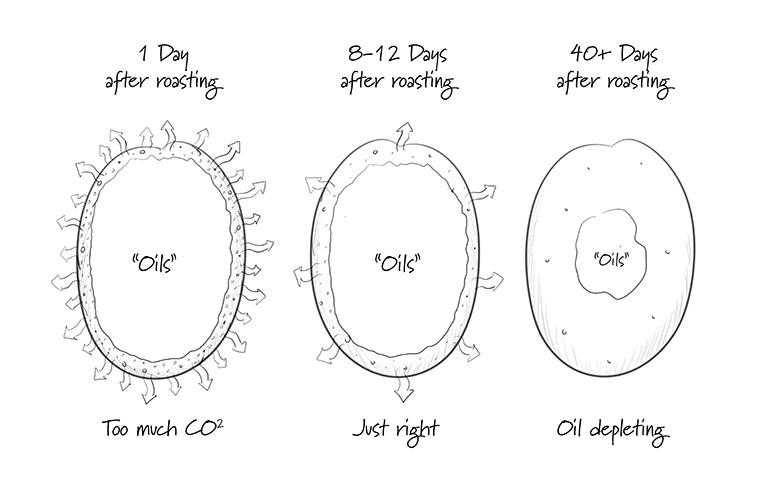 So the optimum time to use your beans is between about 10 to 30 days after roasting. Check the ‘roasted on’ date on the bag and if it doesn’t have one don’t buy it as it’s almost certainly not fresh (your best chance is at your local café – the one with the queue out the door!). So go for a smaller bag of beans, and be sure to check the roasting date! You won't believe how much difference freshly roasted beans make.